I got all of my window casings installed yesterday (I added a picture to the end of yesterday’s post), and now my attention has turned to my fireplace. Before I can install the crown moulding in the dining room, I need to figure out exactly what I want to do with my fireplace. I’ve been thinking about different fireplace overmantel design options that would look good with my fireplace, and I’ve found several that I really like, but I’m still not sure which one would be best in my dining room. For reference, here’s how my fireplace looks. This is an old picture, but the fireplace is still the same except that I removed the hearth. That fireplace is very similar to mine in design and style, and I like that the overmantel would tie in with my music room ceiling. My vision was to carry that design element through the house by using it on the overmantel in the dining room, the ceiling in the music room, and the walls in the hallway. But several people (including my mom 😀 ) have said that it doesn’t really go with my fireplace and dining room (I’m still not sure that I agree), but I want to have an open mind. So I started looking for other inspiration for my fireplace overmantel. I started by going back to the fireplace that inspired the design of my own fireplace. I still really like this fireplace, but mine has gotten a facelift since I originally built it, and so mine has quite a bit more trim on it, and has a much more traditional look to it. So I’m not sure how that overmantel would work on my fireplace, and I think the evenly spaced sections on the overmantel remind me a little too much of board and batten. But I did find this variation that I really like. The smaller sections on the outside are perfect for sconces, and the bigger inside section kind of frames a piece of artwork. But I’m not sure if my fireplace is wide enough for that design. By the time I section off the three sections, I think I’d only have room left for some incredibly skinny sconces and very small artwork. And that dilemma led me to this design, with the one framed section in the middle. I like that it’s a very clean and simple design. I also really like this design. 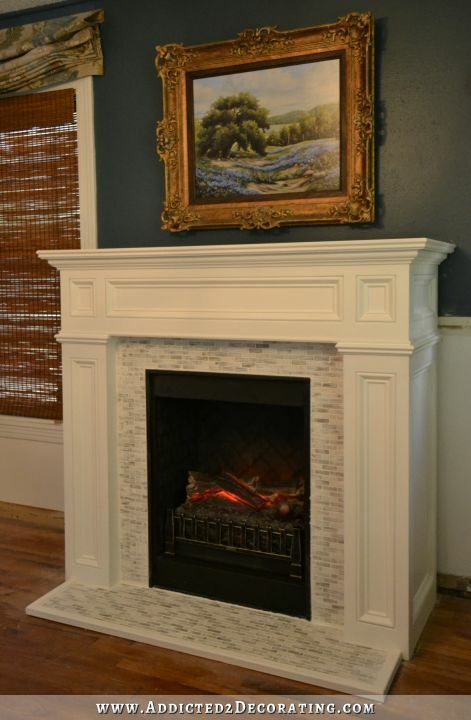 I could use trim on the overmantel to mimic the design and proportions of the actual fireplace. My only concern is that this one might make it difficult to hang artwork on the overmantel. But I really do like the design. I think that one might be better with a fireplace that is much simpler in design, like the one in the photo. Since my fireplace has much more design detail than that one, I almost think that the overmantel needs to be simpler in design. Now right at this very moment, this one is my absolutely favorite. I love the idea of incorporating a mirror into the overmantel to reflect light and make the room look bigger. And I think that I could still hang artwork or some decorative item on top if I want to. So those are the options (and small variations of these options) that I’m considering at this point. Like I said, I’m still not convinced that my original idea won’t work. I mean, the fireplace with the slatted overmantel is so similar to mine, and I think it looks awesome. And I’m still kind of stuck on the idea of repeating that design element in the dining room, music room, and hallway. BUT, I’m flexible. Kind of. 🙂 But I really need to make a decision pronto, because I just have a little bit of wall trim to finish up now that my windows are trimmed out, and then I’ll be ready to start building the overmantel. And I can’t very well get started until I know what direction I’m heading. I agree with your mom, the slatted wood overmantle looks very farmhouse. Like Joanna Gaines shiplap style. Which I love, but doesn’t seem like what you are going for. I like the mirror option, I think it will highlight your chandelier. I love the simple moulding that is similar to your music room, with the mirror (or not!) in the middle. It really goes with the feel of rooms already in your house. Definitely not a fan of the shiplap over the mantle look. I like it in certain rooms, but not in this one. I like your original design idea. 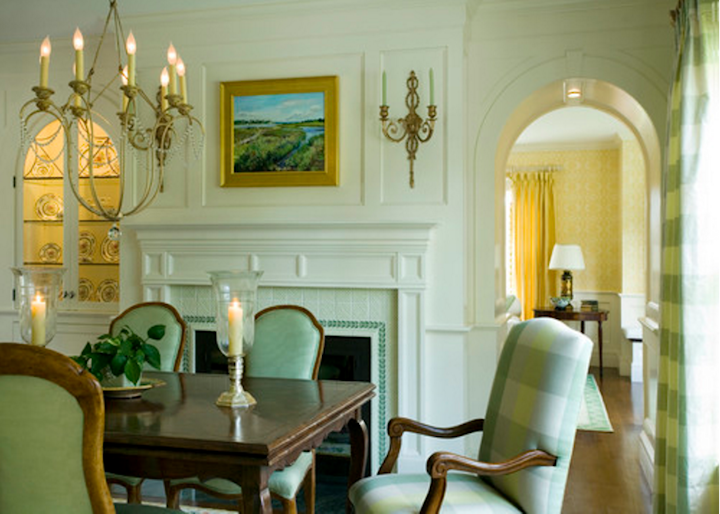 Carrying the design from the dining room to the music room to the hallway makes me feel peaceful. 🙂 It feels like it would flow beautifully. My second favorite is the mirrored overmantle. 🙂 P.S. Your windows look AWESOME!! These decisions can be so hard. We redid our fireplace in stone this past summer. Previously, it was just a builder type of oak mantel and I agonized for months over the look I wanted. I think you have some great ideas. I am sure the right one will keep sticking in your head! Good luck! I still like the ship lap look. I think with the striped curtains and the printed fabric on the chairs it will bring in a homey elegance to the room. I personally like to see different styles meshed together. To me it seems as though the room evolved and wasn’t just “styled”. I don’t usually weigh in, since you always seem to figure things out beautifully. However I must say I FAR prefer that last one, with the mirror. It seems much more in keeping with your renovated fireplace than does the ship lap look, which I equate to cottage/beach type looks. Your kitchen and music room have an elegant feel, that ship lap just doesn’t fit in with, in my mind. I forgot to mention, I’d add (if possible) a counter sunk outlet into the mantel top. Them you can use any type of lamp lighting that suits your mood. The mirror gives the most flexibility down the road to change the decorations on the mantle, which you will do, you know. It also looks great. If I had to describe your style I’d call it “non-traditional elegance” or “traditional with a twist”. Whatever you decide to do will be awesome and I can’t wait to see the result. If you know she won’t do it, why bother suggesting it? The first one (and some of the others) look too top heavy to me. Perhaps because the fireplace is shorter than the overmantel? Also, I think either board and batten or the shiplap are too informal to pair with all the decorative molding you have on your fireplace. I’d go with the one with the single box and trim that out the same way you did on the fireplace. I’d also make sure the overmantel isn’t wider than the fireplace (not the mantel). On that one with the mirror the overmantel extends as wide as the mantel, which looks funny. Just some thoughts. I love the taupe colored design, it may just be the color that is so striking, though. Sorry to say it, but, I really “do not” like the one with all the molding, looks cheaply designed to me. The ship lap is nice, but I would be afraid of becoming bored with the look over time. Not that this would affect you of course, you could rip it down “if” that ever happened . I would do what your gut is telling you and if you love the ship lap, damn it go for it lady!!! I love the clean traditional one, and then add a large round mirror. There are so many square things going on that it will be nice to have the round and it will match your light. You could possibly make the round mirror or there are lots of options to buy. Whatever you decide it will be fantastic! I like the first choice for your overmantel BUT I think a mirror would give the room that wow factor. I agree totally with Katy. Definitely agree with your Mom. Think the shiplap would have been okay with the previous version of the fireplace, but not with how it is currently. Love the last example, with or without mirror. 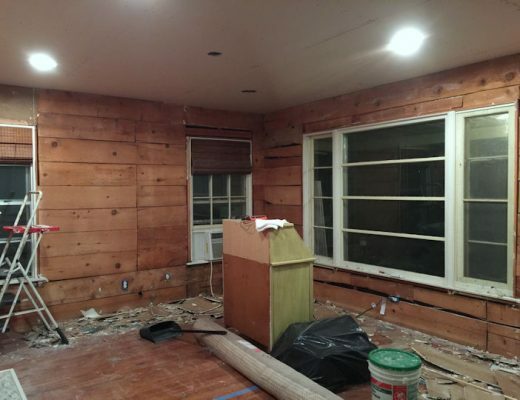 And if you did the shiplap on the opposite wall, it would reflect in the mirror! I’m sorry but I like your original design with the ship lap front on it. You can still hang artwork, a mirror and/or sconces on it. Make sure you do what you want to do. No matter what you choose, any of these options will look good, especially since they don’t involve a television set. I’d rank the nice gilt-framed painting first (which would require a simple background) and the mirror last. Mirrors may make a room look larger, but a lot of people aren’t terribly fond of looking at themselves, especially after age 40! Agree …the one highlighting the mirror. The ship lap design, while pretty, seems in direct contrast to the fireplace you have designed. I believe you need to decide on an overmantel that is more cohesive. The single box frame would look best, but you might have to use artwork instead of the mirror, as your mantle top looks a little high for a mirror. I guess not all mirrors are meant to be looked into, and one over your fireplace would definitely show your chandelier off. You’ll get it right. You always do. I love watching how your mind works. I’m so glad you’re on to the pretty stuff again. I definitely feel you’re like my daughter, but we don’t build, we just decorate. We have done 3 electric fireplaces (two in her home, one in mine) and yet when she went to the last days of a closing florist sale, she bought an absolutely beautiful mantle that we will have to work on. It has a dome shape opening, so we’ll have to design an inside (thinking brick this time) and buy electric logs. Next July her daughter will be moving out of college and into a house or apartment. We know she will love it. Until then, we’ll probably use it to warm up the looks of the Senior Center where she is Executive Director. Life is so much fun. I am in the minority here, but I love the look of the fireplace with the two sconces on each side. If you have the room for that I think it will look gorgeous. I really like the simple traditional style, only with your added trim to match the rest of the mantle. 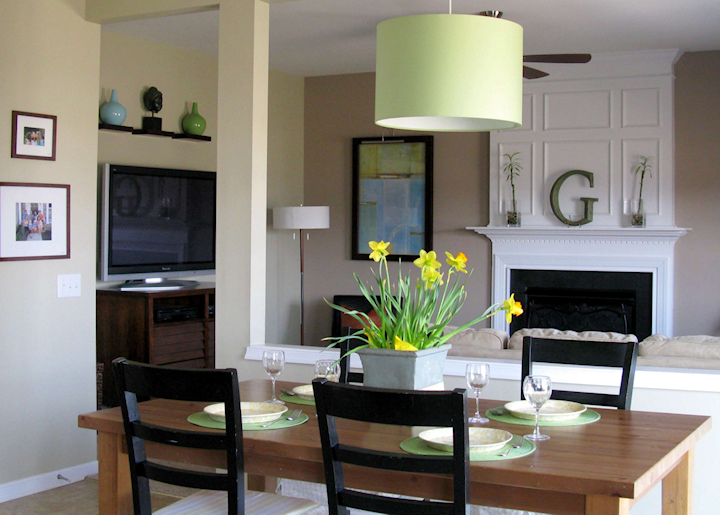 Then you can choose to hang a large mirror, a round mirror, or a piece of art. 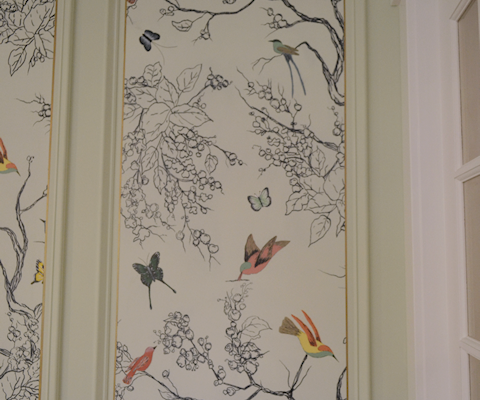 Can you carry over your wainscotting design into the over mantle, with a little twist such as a bolder version of your birds and trees artwork framed? The whisy would be there, but in the colors of the chairs, etc. I’d think that the ship-lap type design would compete with the striped curtains on either side. The round mirror suggestion is awesome. Maybe the mirror could go on the wall into the kitchen, bouncing light from both sets of windows. I’m not liking the shiplap look as it belongs in a farm or beach house in my opinion. I am a big fan of mirrors as they add a lot of interest to a room. So, #4 would be my choice. Whatever you decide, it will be fabulous! I like the mirror one and the simple one. Less is more sometimes and you will have plenty of other things of interest in there. The chandelier, dining set and chairs, striped curtains on each window, different roman blinds, plus other decor pieces. I personally have a whole wall of mirror over my fireplace and it is trimmed out. I love it, but it was here when I bought the house, so I can’t take credit. I think the part that doesn’t “go” is probably the horizontal boards. Your dining room is all picture frame, which is pretty formal/victorian in nature. Horizontal boards read as “cottage” to most people, I think. Also, as you mentioned, you’ve added a lot more rounded trim to the original fireplace design, so it makes the whole fireplace look more formal, which is an even bigger contrast to the cottage look. What if you just made one big panel on the top with molding to match the smaller fireplace panels, then choose a large piece of artwork or mirror with a chunky frame that fills at least 3/4 of the panel? Or you could wallpaper or fabric-cover the panel to give it texture without needing the horizontal boards? You only need a mirror or picture. Your space is to small with the windows. It would look much too crowded and overdone to add woodwork. You may be able to add two small decorative scones but they need to be very narrow and long. I like all the options except for the shiplap. The mirrored one is very nice. I liked the original design. I think tying those elements together in the different rooms is smart. I like the simplest one, with a round mirror (like the other posters I think a round element would be nice). But, really, they are all beautiful! I agree with your Mom. I also vote for the mirror. Instead of permanently installing it, you could hang it, making it easier to add art whenever you want. I like both the horizontal planks and the single open space. Both will allow a lot of different flexibility with hanging art or a mirror. But, the open space will always need something hung there, whereas the planks provide enough visual interest/texture that you can display art on the mantle, or leaning against the wall like in the inspiration photo, not just hung (plus I’m just a huge fan of the shiplap look so I’m biased!). On the other hand, with the striped curtains, that’s a lot of horizontal stripes. Your vision though is so good whatever you choose will look great. Love the mirror! While I really liked your shiplap idea initially I feel it would be too many stripes with the striped curtains too. I like the version with the 4 small botanical prints and/or the one with the mirror. Your room is looking great! I’m not sure I like the inspiration photo for it, but I liked your mock photos very, very much. I think how wide/long those planks are will make a huge difference. I don’t really like the new ideas – also, some of those look really similar to what you will be doing with the wall right across the fireplace, so this means that a) you could have consistency issues and b) doesn’t the fireplace deserve to be different? I think you should go for the design with only one frame, no divisions, with or without mirror. I agree that the space might not be enough for divisions. But if you decide to make it with divisions I am sure you will make it work. You can always change or re-do it if you do not like it. That is what I like about you, you are not afraid of changing something if it does not turn out the way you wanted and you never give up until you find the right look. I enjoy very much following your blog, please do not stop sharing your projects! I agree with your Mom, that the slatted wood design now doesn’t match the new style of your dining room. I really like the ‘Traditional Family Room’ design and even more so I really like the mirror design in the last picture by ‘Summit Interior Designs’. I disagree with mom (sorry mom! ), I believe your original idea does go with your music room ceiling. The only problem that I see is that it’s a bit blah (sorry!). I really like the last one. I think the mirror-mantle would look awesome and if I had to choose… That would be my vote. Hope this helps. Stay true to yourself! You have lots of options listed, but do any of them appeal to you the way the ship lap did? 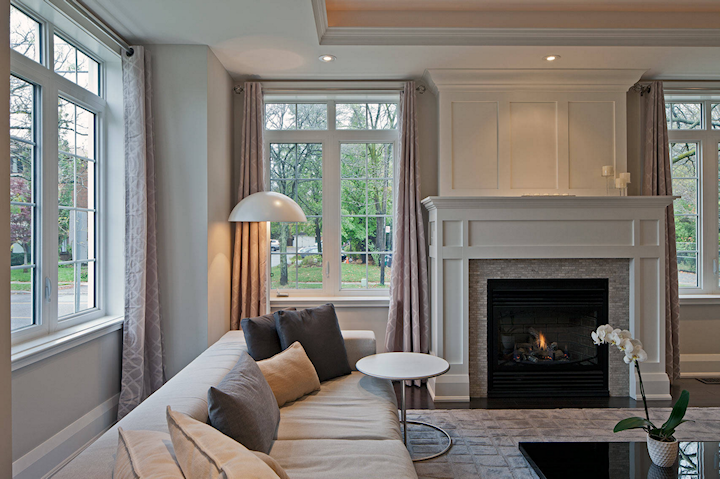 Perhaps the answer is to remove some of the trim on your fireplace to make it more cohesive with your design plan. Whatever you decide, I have no doubt it will be perfect! Do you still feel you NEED a fireplace in that small room since t is now a dining room? Would the buffet look better there? Can the fireplace go in the new family room and therefore have more options? I like your first choice. I do not think it looks too country or whatever. It ties all the other rooms but not so much as it looks too matchey just co-ordinates very nicely with each other. Go with your first choice it was spot on in my book. Thanks for reading. I can’t believe I’m writing this but try shiplap, then keep trying the others. I finally understand you have the time and resources to experiment several ideas, so we don’t have to. I would love to see what the shiplap would look like and if it works or not.☺ I like the designs you picked so any one would lovely to my mind. I love the mirror but I would definitely antique the glass to blur faces being it is in the dining room. That being said I would tone down the mirror by doing the first top picture and adding the antique mirror into the three equidistant areas. This way you have the mirror option but also could hang art or a natural element over the mirrors. Love the mirror idea, especially if it was beveled! Your first preference to me is so casual in comparison to the overall style you are working toward. I do also like the 3 panel frame version, feel they carry through from your music room design. I don’t think you can go wrong with whatever you select and look forward to seeing the final. G’day! Don’t usually weigh in from Down Under but I think you should enjoy the best of all worlds. 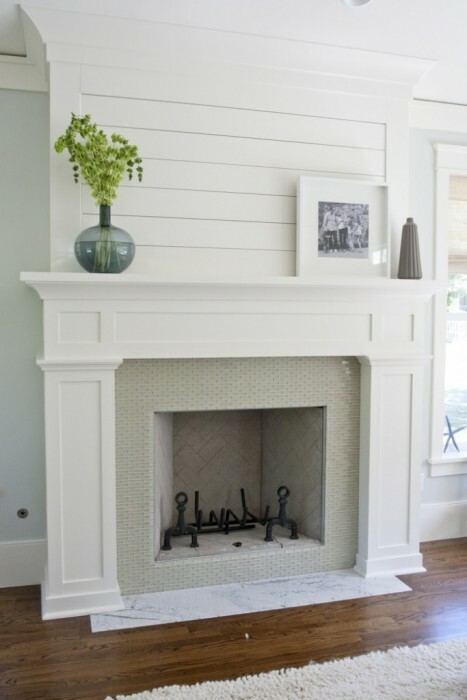 Use the tongue and groove timbers, but framed out to mimic your fireplace, then silicone well between the slats so you end up with a lovely glossy paint job. Then hang a beautiful mirror and it will appeared ‘framed’ by the tongue and groove. Sorry, had you use Australian words … hope you know what I mean! Have fun! BTW, what did you take on for 2016? Fun? Adventure? Joy? My own house presently looks like a hoarder’s best dream (everyone else’s worst nightmare) as two rooms are emptied for the painters! But I am enjoying creating beauty all around me! I like ( for you ) the one with the single framed element. I would hesitate to do the mirror in a permanent application, it will limit you. If you do the single frame design, you can then add a hanging mirror, with the idea that it can be changed out to art if you get bored. ( Like I do! 😉 ) I also like your original idea, and don’t think it will look bad, but with crown, the design could read as conflicting. But I’m just an amateur – what do I know! Let the heart lead! area, don’t do what they did in the photo and add 4 small frames ( the ferns); it looked silly. IMHO, one large mirror or piece of art is the way to go. Can’t wait to see ” who wins”! I love the idea of a Mirror as it reflects light and gives another dimensions to the room. But you will come to a solution and I bet it will look great. I see the beauty in most of these. My favorite for your dining room is the single center square. Mirror or art. Some great ideas, but not sure that an idea or theme has to be carried out in every room. design and either paint it black or white. I don’t think I would install a mirror, instead I would find a mirror to hang. It gives you much more flexibility in future decorating. Whatever you decide for the wood design will be great. It always is. Besides you are the one that has to live with it. I like your original idea, but the mirrored design is my second favorite. I’m sure whichever design you choose, it will turn out gorgeous. I can’t wait for you to get this particular project done because I’m planning my own project, based on your condo bookcase wall and your fireplace. I’ve been struggling with the overmantel (sadly, I will have to hang a television on it) and I just know that when I see what you’ve done, I’ll be inspired, because you truly are an inspiration. Still like the original design! Several of the others are nice but the only other one that really grabbed me was the large framed section. I guess the mirror one works too but I’m not a big fan of mirrors so I kind of flew past that one. 😉 For the width of your mantle, a lot of the others just seem overly busy. Or at least the way it reads online. It’s always hard to tell when you’re not seeing something in person. In the end, I’m sure whichever direction you go in, you’ll pull it altogether. I think I’m still partial to your original design idea with the slat insert that repeats the music room ceiling design. If you decide to go with something different, my preference of the new designs is the simplest one, with one large open space. I’m sure you will settle on a design that makes you happy. Look forward to seeing what you decide. It looks great! While any will work, I think #2 is my least favorite for your space with #4 being close behind it. I think #3 probably ties in with your space the best and the current architectural detail, but I think it will solidly tip the room more “formal”. While I agree with the comments regarding the shiplap look being more farmhouse/cottagey, with the striped curtains and the use of that look in other areas of your house, I think it will work, and be that twist that keeps the room from seeming more formal than I think you desire. 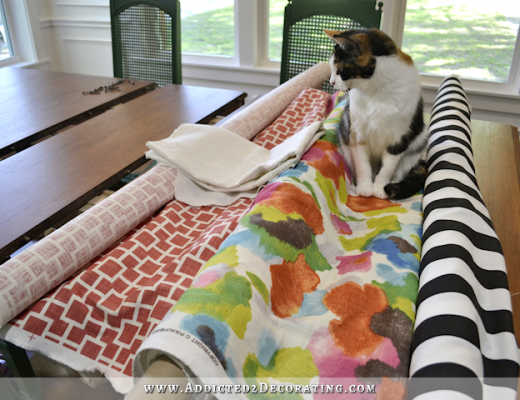 Especially with the striped curtains…I think if you leave the striped curtains out and did a more formal window treatment fabric (like your original curtains when it was a living room), the shiplap will move from a fun twist to a really off note in the room that doesn’t work. It is looking so great! It is amazing how fast it feels like it (the music room, entry and dining) is coming together…it felt like you had sooooooooo far to go when the drywall was pending, and now, it feels like the end is in sight–at least as far as the construction projects go. Then it is time for the fun stuff you’ve been looking forward to: Decorating! Love your blog and inspiration. Thanks! You should always listen to your Mother. She knows best.